I read an article recently that New Yorkers still reign supreme as lovers of brunch. I think perhaps it has something to do with the free flowing mimosas or the Sunday New York Times, and I know when I’m there visiting my son we always have Sunday brunch with his friends. Well, he was home recently, and not to be upstaged, we had a little belated Mother’s Day brunch at my house. I always do some standard things for brunch – like a ridiculously large amount of bacon to keep my gang happy – but this time got the idea to create this breakfast casserole. It wasn’t just good – it was great, if I do say so myself. 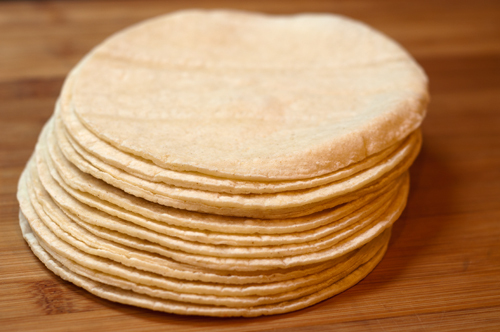 You’ll need some corn tortillas to start – I like white corn, but either will do. Those get fried off in some vegetable oil. I used olive oil – just make sure the heat isn’t too high. If the oil is smoking, turn it down a bit. 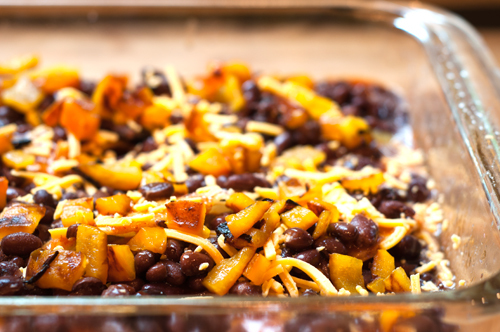 Break them into large pieces and layer the casserole with half of them, topped by half of the red enchilada sauce, a can of black beans, and some diced roasted peppers. Sprinkle a little cheese on if you like – or alot if you like. Repeat with another layer of crispy tortilla pieces, the rest of the enchilada sauce, the rest of the peppers, and a little more cheese. At this point you can put the casserole in the refrigerator (covered) until the next day if you’re making it ahead of time. When it’s time to bake off your casserole, simply crack eggs over the top of it and sprinkle with a little salt and pepper, then bake until the egg whites are set, but let the yolks stay runny. If you’re having trouble getting the eggs to set up quickly enough, you can place it under the broiler for a minute or two, but this will also cook the yolks more. Sprinkle the whole thing with green onions and serve with salsa, avocado, and sour cream. 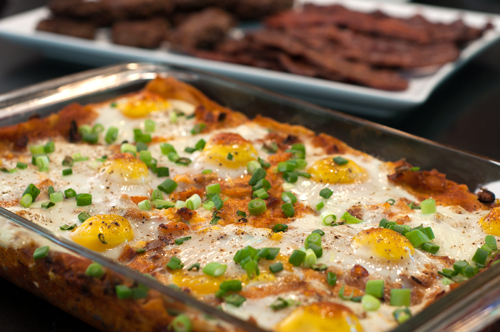 Now that’s a brunch casserole! 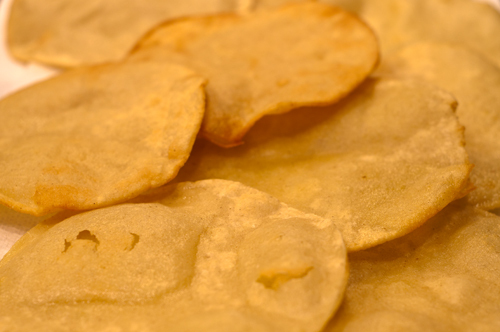 Break the crispy tortillas into large pieces. Spray an 11 x 13 baking dish with cooking spray, then layer half of the tortilla pieces on the bottom. Pour half the can of sauce over the tortillas, the spread half of the peppers and all of the beans over the top. Sprinkle on some cheese as desired. 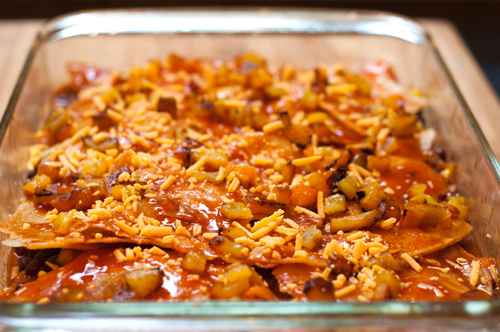 Layer with remaining tortillas, the rest of the sauce and peppers and more cheese if desired. 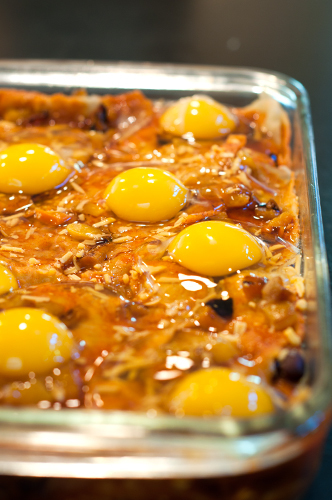 Break the eggs carefully over the top of the casserole, taking care not to break the yolks. Bake at 375 until egg whites are fully set but yolks are still runny, about 20-30 minutes. Serve with garnishes at the table. Can you use tortilla chips instead? I’m sure those will work – just frying the tortillas gives you flatter pieces! What specific enchilada sauce do you use? Any brand that’s in your supermarket will work fine! Old El Paso and Las Palmas seem to be the brands carried in mine. This looks so good! I was wondering what size can of sauce do you use! It looks wonderful can’t wait to make it.I’m sure we wont be able to eat it all . Will the left overs be okay? Might get a little mushy, but that never stopped me! Great dish! Loved all the components. We added refried beans and chopped onion with the peppers . Eggs didn’t cook well at all, so we will cook them separate and add them on top next time. Yummy! I made this and loved it! The flavors were wonderful! My eggs did not cook evenly though. They were overcooked on the edges of my dish and still raw in the middle of the dish. Any suggestions? I noticed that you said you can premake this for the next day bake. Will it get soggy? It’s been a long time since I made that, but pretty sure I made it the day before and it was fine!